Recently, +John Mueller specifically said that if GoogleBots experience a high response time of “over than 2 seconds to fetch a single URL” from your site that Google will “severely limit the number of URLs it will crawl from your site,” as reported by +Barry Schwartz. 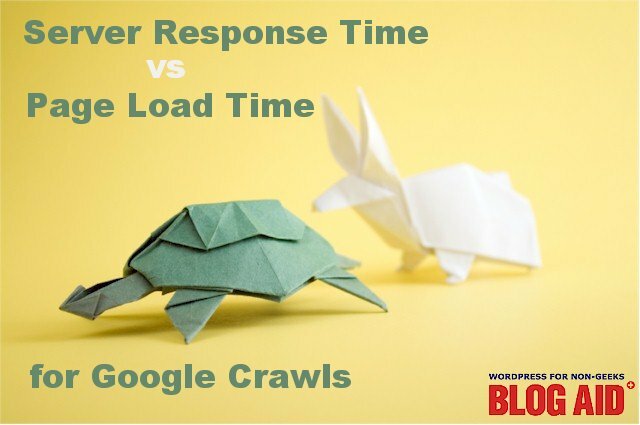 Then in a post on this topic from +Ana Hoffman he clarified that the “difference between server response time and page loading time” must be addressed and asked if anyone could write a post about that. And this is the same type of info I gather in Site Audits to help you get your site clean and lean. This part of the post concerns your overall page load time. It’s super easy to see the response time of your hosting, and what affects it. My favorite online tester is WebPage Test but it has been experiencing a lot of issues lately with its testing sites in the northeast of the U.S. If you use this tester, be sure to select a more western location to get accurate results (as shown below). And choose Firefox as the browser because it caches less than Chrome and will give you worst case results, which will do you more good in knowing what to fix. Once the test has finished, click the Details link in the navigation. There you will see the Waterfall View. The first line is your server response time. Here’s the one for BlogAid. And here’s the legend for the color bands. 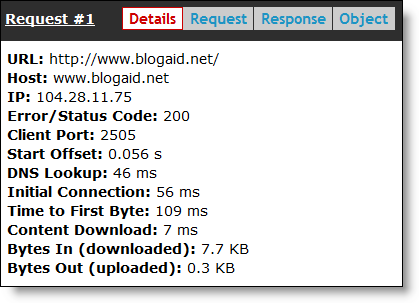 As you can see, it took 116ms for all 4 of these events to happen when the homepage of BlogAid was requested. For easy conversion, that’s 0.116s. If you want to get into the nitty gritty of each of those elements, then you can click the link in the left column of the waterfall and bring up the details. They will display in a pop up that looks like this. You can see exactly how much time each element took. Above the waterfall you’ll see all of the load numbers for the page. The first number is the full load time of the page. As you can see, it’s 2.518s. I’m in the process of revamping the site and won’t stop tweaking until that comes in under 2.0 seconds. In the 3rd column, you can see that the page has a Start Render time of 1.526s. This section deals with each request made from the server. You can check the time it takes for each element of your page to render, and that’s the response time that Google is checking, if I understand John Mueller correctly. Below the Waterfall you’ll see a Request Details list of each element requested from the server. This chart shows the initial connection times plus how long each element took to fully download, and so much more. It’s basically an informative index of every request, and it’s origin, that is required to produce the rendered page. The speed of your host server is the biggest factor in response time. But it is certainly not the only factor. The DNS Lookup is the first thing that happens when a visitor or a bot requests your site. (That’s the first blue band in the waterfall.) And using a CDN like CloudFlare or MaxCDN will impact that too, as they become your nameserver. Number of servers delivering the content can impact load time too. Several items can come from outside your hosting account like Google fonts and counts on social share buttons, plus ads, if you run them. Time to First Byte can be impacted by a whole slew of elements. FYI, there was an infamous article by CloudFlare a while back that suggested time to first byte was meaningless. They were deluged with ridicule over that. But, I still love them in spite of that one trip up. Mainly because they not only speed up the site, but CloudFlare is the only free CDN that offers some modicum of bot protection too. If you could see the bots crawling your unprotected site, it would look like a roach invested apartment. They eat up system resources. And that negatively impacts every legit visitor and bot that wants access to your site too. It also affects load speed. There’s a reason why you don’t see posts from me with generic advice about how to make your site lean and clean. It’s because they don’t give you any specifics to do. Okay, that’s great. But can you make those changes? Do you even know where to start? Do you know how to measure the effectiveness of your changes? Ready for a real site audit yet? You’ll get a detailed report (30-40 pages for the Gold audit) and a live chat (up to 2 hours) where we go over everything, in layman’s terms. You’ll fully understand exactly what the problems are and what needs to be changed, tweaked, or fixed. Then we can make a to do list that breaks it up into bite-size phases. You decide exactly what you want to do and what you want some help with. Recently, my site audit client, Kelly Wilkness, took the page load speed of her site, My Soulful Home, from 11 seconds down to 3 seconds. It took her all of 10 minutes and she did it all herself. She just needed help identifying what needed to be done. That’s the power and clarity a site audit gives you. Great article with lots of very useful information, MaAnna. Thank you!WebPageTest.org is my favorite page speed testing tool also. I was interested to read your suggestion about using Firefox as the browser setting, too. I will try that out. One thing I do when I run WebPageTest is to run multiple runs and then use the median as the most realistic indicator of the load times. I use 8 runs, usually.Thanks again!